This powerful, funny, and inspiring new documentary from filmmaker Emily James tells the thrilling story of a remarkable group of environmental activists as they wage a series of direct-action campaigns across Great Britain and Europe. The main subjects are five young British activists whose serious commitment to environment justice and nonviolent resistance is rivaled only by their wicked sense of humor and satire. The film brings us inside the group's spirited planning sessions, and takes us on a wild ride as they clash with police, blockade factories, occupy coal power stations, and glue themselves to factory floors. With its deeply human take on the principles of civil disobedience and the pragmatics of political activism, Just Do It is an excellent resource for educators looking to inspire discussion about the kinds of nonviolent movements that are now sweeping the globe. Especially suitable for courses in political science, government, environmental ethics, and sociology, and for campus event programming dedicated to social issues. Emily James studied documentary directing at the National Film and Television School, her student films already winning international awards. After her first broadcast commission -- The Luckiest Nut in the World (C4, 2002) -- The Guardian asserted "Emily James is a genius... and will in time be revered as a television innovator." Following the experimental Don't Worry (C4, 2004) and What Would Jesus Drive? (C4, 2006) Emily's attention has now shifted to feature documentaries. 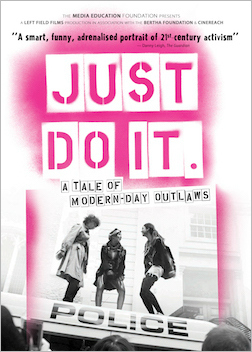 Her feature debut, Just Do It -- a tale of modern-day outlaws screened in over 45 independent cinemas across the UK in Summer 2011, alongside a far-reaching community screenings program. "A smart, funny, adrenalized portrait of 21st century activism." "Fun and bold, with endearing, vibrant characters." "An astonishing movie that goes behind the scenes of climate activism during 2009 . . . from Climate Camp to the COP15 protests in Copenhagen and beyond." "Just Do It is a close-up look at environmental direction action. [The film] puts a human face on [activists] whose actions are, depending on your standpoint, courageous, empowering, inexcusable, humorous or frightening." "Just Do It lifts the lid on climate activism and the daring troublemakers who have crossed the line to become modern-day outlaws. A story of people standing up for what they believe in and making themselves heard." "Seriously topical but never so serious that it gets caught up in polemic, it's a terrific story packed with characters and told with passion. Rousing stuff."